I spent an afternoon last week interviewing candidates for the American Chamber of Commerce in Vietnam – Hanoi Chapter (AmCham Hanoi) Scholarship Program. My fellow panelists and I were charged with evaluating their interpersonal skills, achievement orientation, analytical skills and problem-solving skills through a series of questions. In addition, the students had to respond to a pre-assigned topic about a hypothetical situation for which they had five (5) minutes to prepare before the 15-minute English language interview. Since the scholarship program is “looking for smart, quick-thinking, confident students who show the ability to clearly communicate their ideas under pressure,” our job was to evaluate and rank them on that basis. For most it was their first formal interview experience, a kind of “job interview lite.” It was fascinating and inspiring to learn about their passions and dreams. It some cases, they were directly related to their majors; in others, totally unrelated. Most expressed the desire to study overseas and earn at least a Master’s degree. They all indicated a strong commitment to making their mark in a particular field and contributing to Vietnamese society in some way. In a country in which “good help is (often) hard to find” because of shortcomings in the educational system most of these young people are the type of employee I would want working for my company. 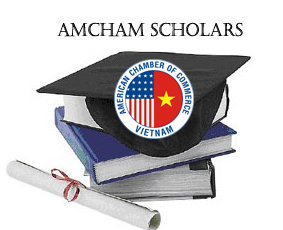 In addition to the the AmCham Scholarships, which are useful to all concerned and a great source of encouragement to the recipients, my hope is that the US corporate community in Vietnam will consider funding more substantial scholarships that would send a select group of outstanding young Vietnamese women and men to study in non-degree and graduate degree programs in the US.